Here is my "incomplete", as of yet, "working on it" walkthrough toward solving the Homeless:1 CTF posted by Creatigon to the Vulnhub database on 06 Dec 2017. Difficulty: Difficulty level to get limited shell: Intermediate or advanced. Difficulty level for privilege escalation: Depends on You. Author Provided Hints: This challenge is not for beginners. There is a relevant file on this machine that plays an important role in the challenge, do not waste your time trying to de-obfuscate the file, If you got big stuck, Try with Password start with "sec*" with nice wordlist. Ok.. Try Harder!.. Lets review some of the files. Hum.... a hint regarding using the "rockyou" wordlist? Please check carefull.... Good luck!.. So, now we navigate to the new URL and find and uploader form. I looks like it will only take a file with a max size of 8 bytes. You will see that the answer is exactly 8 bytes. You can then upload this "hack.php" file and then open it in the url. (i.e. /myuploader_priv/files/hack.php). It will result in a ls listing of the server where we find a hidden text file named in a SHA-1 hash format. Well Done! Next step are waiting..
Nat McHugh has a nice blog post at https://natmchugh.blogspot.com/2014/11/three-way-md5-collision.html?m=1 detailing 3 binary image files that he created that map to the same MD5 Hash. 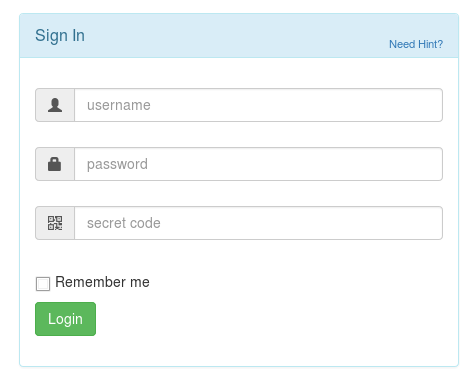 I saved a local copy of the login form and changed the fields to file fields and made the form a multi-part/upload form.... then uploaded the images... that didn't work. :-( .... would have been nice .... but, the author is explicitly casting the variables to (string) in the code... so I expected as much. Now, to make the 3 colliding files. This process is sort of described here: https://sfrolov.io/2016/09/multiple-md5-collisions. 2. We will use msg1.bin to generate two files (msg2.bin, msg3.bin) using a prefix seed to have a known collision seed. 3. We will take the last 128 bytes of the seeded file msg2.bin to create another seed file. Just curious, to give you another avenue, on the uploader, have you tried to change the MAX_FILE_SIZE on the form? Perhaps it can be altered to get a shell. If the PHP config file has not been changed, this could technically work. 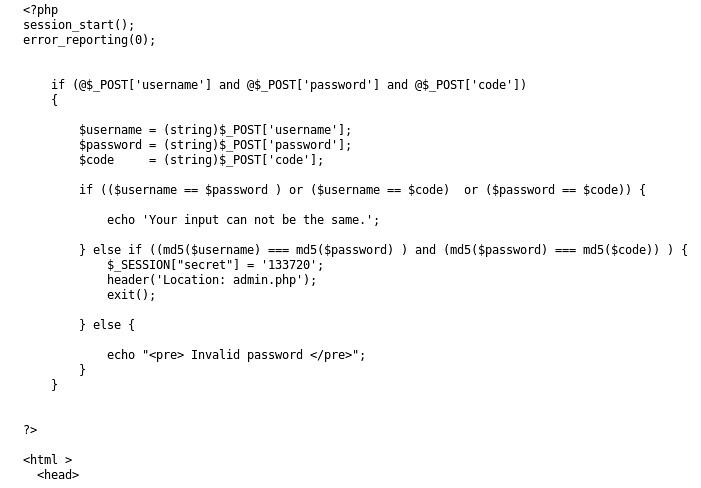 For the login panel, try going to admin.php to see if the session is enforced on that PHP script. Session injection sounds like a good idea. Hope you make progress on this. Hi, the walkthrough of this ctf appeared on youtube yesterday - 28.Feb and the creator also sees "Cyberdog Sledding Portal". I however, clearly see "Cyberdog Starting Point" and searching with this image produce results proving my point. Also, you can clearly see 5 letters on the last word in the favicon, but you state it is 6 letter "portal". I am wondering how did you come to conclusion that it is "Cyberdog Sledding Portal". I also asked creator of the walkthrough on youtube. I am asking, because there is no indication that it is what you say it is. Thanks Craig, I thought that I missed something really obvious. However, it is disappointing that you need to guess to progress when the actual information possible to gather points somewhere else. I put the original favicon with resized and layered file I found by searching with the original favicon image (you can check it out https://prnt.sc/ilme02 - it doesn't prove what the writing is 100%, but it proves that the last word of the writing can not be "portal").